We're staring down the barrel of some serious improvements in mobile graphics technology, as today Nvidia is demonstrating their upcoming Logan chipset for smartphones and tablets, set to be released sometime in the first half of 2014. While previously Nvidia's SoC (system-on-a-chip) GPUs have been average in terms of their performance, Logan will see their Kepler GPU tech, famously seen in their GeForce 600 and 700 series discrete graphics cards, adapted for use in a low-power package. 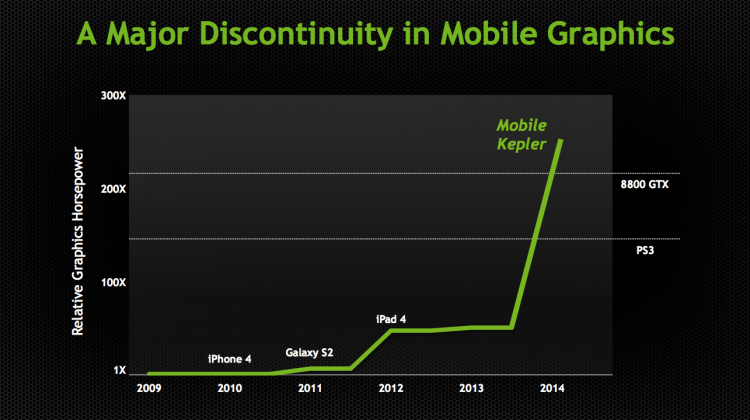 Bringing Kepler to mobile platforms will be a huge step forward in terms of graphics capabilities on portable devices, with Nvidia showing that the mobile Kepler unit to be included in Logan chipsets will be faster than a PlayStation 3 or their older GeForce 8800 GTX chip. This could enable performance of around 400 GFLOPS to smartphone and tablet GPUs, and although memory bandwidth restrictions may dictate the final graphical capabilities, it still represents a significant leap in power. Nvidia didn't want to share too much about the Logan SoC, so we don't have any idea of what CPU cores, the core arrangement, GPU frequencies or memory subsystems it'll have. But the early silicon they recently received from fabrication plants is very capable. In a video seen below, the Kepler Island demo is shown running on a mobile version of Kepler with OpenGL 4.3 and hardware tessellation support, soldered to a development board running Android with a 10.1-inch 1920 x 1200 display. Aside from fully supporting tessellation, mobile Kepler will also see OpenGL ES 3.0 support like some other chipsets currently on the market, but more importantly it sees OpenGL 4.4, DirectX 11 and CUDA 5.0 support for the first time. The new APIs supported by the chip will no doubt appeal to game developers wanting to produce high-quality games for mobile platforms. Nvidia also impressively showed off their FaceWorks Ira demo on mobile Kepler, first seen running on a fully-fledged GeForce GTX Titan at GTC 2013. The demo did require some adjustments to run on a platform using 2-3 watts of power, including simplifying skin shaders and reducing the rendering resolution to 1080p, but it's nevertheless still eye-catching. Come the time we start seeing Logan chipsets inside tablets and smartphones, it's unlikely the full power of the GPU will be unleashed as power consumption will be a concern. Nvidia claims the GPU is more power efficient than Apple's A6X chip used in the iPad 4, but pushing the chip to its peak (possibly five times the performance of the A6X) will likely produce too much heat and consume too much power for the everyday tablet. Still, this is an extremely exciting development for mobile graphics, and by this time next year hopefully we'll see the beginnings of Kepler mobile GPUs hitting the tablet and smartphone market.